There are many career opportunities after graduating from VFS, but one seems to cross all students minds at one time or another: What do you need to know to start your own game studio? There is no one answer, but Jesse Joudrey formerly of A.C.R.O.N.Y.M Games had some valuable pearls of wisdom that can help any ambitious gaming entrepreneur get the right start. Jesse visited the Game Design campus on October 11th to kindly share 8 important lessons he learned from the 8 years of running a successful video game studio. In 2004, Jesse and Daniel Swadling wanted to fulfill their dreams of making their own studio, so they combined forces and created A.C.R.O.N.Y.M Games from their apartment. The company went on to develop multiple games, such as The Secret of Monkey Island (Special edition), Wipeout, and The Family Guy Online. The studio had grown to 42 employees before Jesse departed to start Jespionage Entertainment. 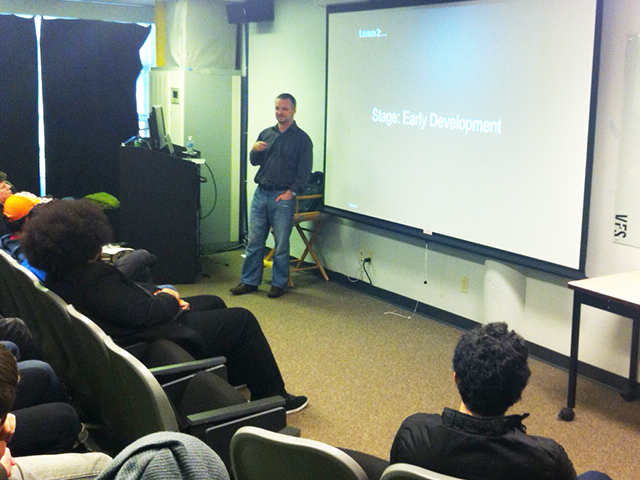 In his presentation, Jesse divided his lessons into the different stages of studio development. After graduating and landing a job at EA, Jesse had accumulated enough valuable experience to confidently create a studio. The reality of the graph was also in his favor. This is a crossroad between capability and freedom, where your skills will grow with time but your freedom will decrease as a family is on the horizon. 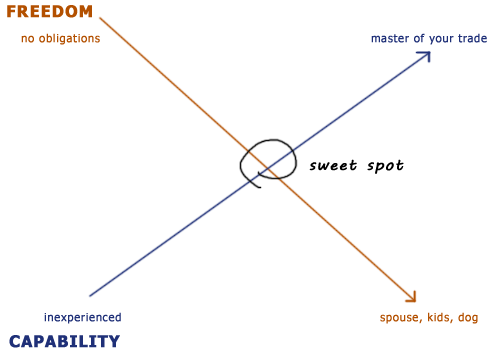 The sweet spot to start a company is the middle point where the two roads cross. Lesson #1: You are in a race against life. The two men had programming backgrounds, but neither could generate art. When they hired an art team they were very humble with their feedback, which was partially due to their inexperience of managing artists. Eventually, they hired a creative director to delegated artistic responsibilities who could properly critique the art. This feedback was essential to improve the overall product. Lesson #2: Everybody needs someone to tell them when their work is crap. There was a term that Jesse threw around called OPM, which stood for Other People’s Money. A publisher was needed so they could build their first financial bases, but how did they find those publishers? Jesse hired an agent to find them, but it also made him aware of the vicious trap that many have fallen into when taking OPM. To get more details, you can read more in his arcade article ‘OPM – Opium‘. Lesson #3: When you are taking other people’s money, you are taking it forever. At this time the company was growing. They needed to hire extra people and pitch other products. They were approached by publishers who wanted to do sequels. Sadly, the terms for these contracts were usually no better then the original. Jesse warned that even with promises of future money, you will have to exercise caution because it might not be a good fit. Lesson #4: Always balance your budget against the project you have. In the same stage, communication with publishers were taking place. The illusion of a speedy business was very quickly revealed, because it took usually 6 months to see any of the money. If anyone says they are fast, then don’t be fooled. Business is a looooong process, so plan accordingly. Lesson #5: The speed of business is a silly thing to brag about. A.C.R.O.N.Y.M Games had to present game demos to publishers to prove they could pull off what they were proposing. Jesse explained that this can be a dangerous thing because demos require money. If you invest too much in a demo then it can be your worst adversary. In an example, he said if the publisher likes it then they will offer you a contract, which puts them in a powerful position because the publishers know you will loose money from the demo if you walk away. To learn more, you can check out Jesse’s article called ‘Betting Big on a Free Demo‘. Lesson #6: Don’t over invest in your demos. By now the game studio had more freedom to pick what projects they wanted to work on. Everyone has their own method to determine what makes a good fit, but Jesse compiled a functional 10 point scale that is easy to adopt. Just give everyone 10 points, and subtract for each section they fit under. The market will dictate what values work for you, and at what time. Jesse referred to Steven Cubby’s seven habits of highly successful people for Lesson #7. Lesson #7: Win win, or walk away. Pick a partner that wants to project to succeed. In the same stage, Jesse’s studio was being approached by people who wanted to make their dream projects into a reality. Now, as any game design student and employee knows, production will change every aspect of the game. These changes are described as assaults against the dreamer’s vision. A.C.R.O.N.Y.M Games tried to make several dream games possible, but they all ran into the same inability for the dreamer to adapt. In the end, it never worked out. Lesson #8: Don’t work with anyone on their dream project. These were the 8 pearls of wisdom that Jesse had imparted upon us, but he concluded by saying not all of them are necessary to start a company. You could find counter examples for each one . However, there is one more lesson that he feels is required to start your own gaming studio. One that all students attending Game Design are being prepared for. This is the NEED for Motivation, Capability, and Resilience. That leads us to the final lesson: Don’t let anyone tell you it is too hard. Personally, I found the presentation very informative and refreshing. I appreciated Jesse’s honesty of his triumphs and failures, and was grateful that he chose to share the knowledge he acquired from this 8 year journey. Contributions like this help students look at situations from another’s eyes, and grow as individuals as we find our place in this fast changing industry. I look forward to hearing the new lessons encountered as he embarks on his new journey with Jespionage Entertainment. Good luck, Jesse! “The experience and exposure I got through the Game Design course was amazing. I was able to learn from the best and was also able to generate long-lasting friendships with many of my previous instructors, who I'm now able to join as peers in the same industry.